We are a nation in love with cars and, consequently, with consuming gasoline. Over 90% of North American. households own a car, with the average household owning two or more cars. That means the majority of our nation is dependent on gasoline for our transportation needs. Now that gas prices are rising dramatically, everyone is feeling the pinch on their collective wallets. The average price at the pump is approaching $1.35/ltr -$4/gallon, and many speculate it could reach $5/gallon in the summer months. It’s probably time for you to re-evaluate your gasoline consumption and find ways to stretch your MPGs. 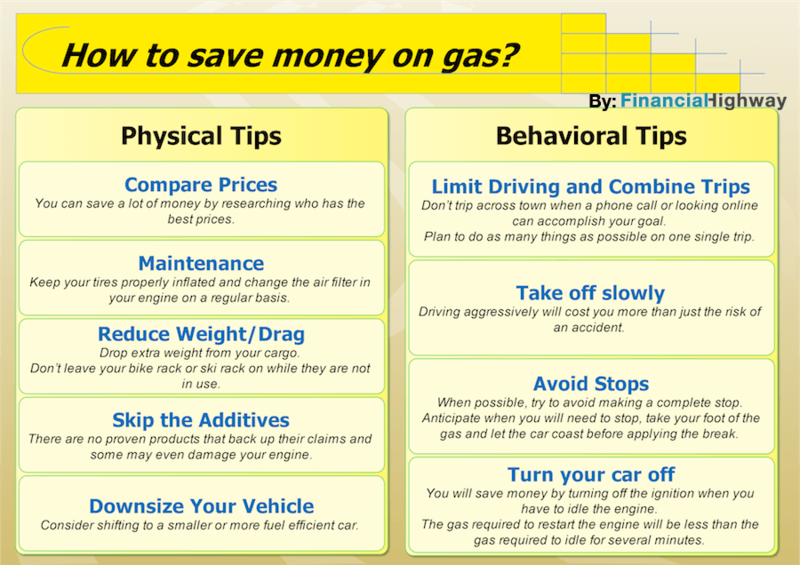 If you are wondering “how to save money on gas?” I hope the following gas saving tips can help you put a few bucks back in your pocket. Compare Prices: Chances are not every gas station in your area sells gas for the exact same price. You can save a lot of money up front on gas by researching who has the best prices. There are gas price websites that can aid you in identifying the cheapest gas in your vicinity. Generally, gas stations closest to freeway entrances and airports will have the highest prices. You can also use apps on your smart phone to save money on gas here is a list of top 9 Apps to Save Money on Gas. fuel efficiency when driving. Also, change the air filter in your engine on a regular basis. The air filters in most cars are easily accessible and you can change them yourself in five minutes. Proper car maintenance will save you money in the long run. Reduce Weight/Drag: Keeping your bowling ball, golf clubs and extra bags of sand in your trunk is a sure way to burn gas unnecessarily. Consider what extra weight you can drop from your cargo. Also, don’t leave your bike rack or ski rack on while they are not in use. The extra wind drag burns excess gas. Skip the Additives: Don’t believe the hype when it comes to gas “pills” or liquid additives that supposedly boost MPGs. There are no proven products that back up their claims and some may even damage your engine. Even if they slightly increased fuel efficiency the money spent on the additive itself would negate any cost savings. Downsize Your Vehicle: This is probably the most difficult but most effective change to make. The truth is a monster truck or SUV will guzzle gas and greatly increase the cost of filling your tank. If possible, consider shifting to a smaller or more fuel efficient car. At the right price, a hybrid can be a wise choice that will dramatically lower your gasoline needs. Motorcycles and scooters use even less gas and may be a good option for making those short trips around town. Limit Driving and Combine Trips: When it’s time to run errands, a little advance planning can help you save a whole lot of gas. First, don’t make senseless trip across town when a phone call or looking online can accomplish your goal. Second, plan to do as many things as possible on one single trip instead of making several separate trips. Take off slowly: It’s fun to see how fast your car can go from 0-60 mph, but burning rubber of the line at stop light is a sure way to waster gas. Don’t be in such a rush. When you accelerate, do so slowly and watch the MPGs steadily rise. Driving aggressively will cost you more than just the risk of an accident. When driving around town, try to find routes that require the fewest stops. Continually stopping and accelerating require more gas than sailing along smoothly. When possible, try to avoid making a complete stop altogether. Anticipate when you will need to stop, take your foot of the gas and let the car coast before applying the break. If a red light turns green and you’re coasting at 10mph, the engine will require less gas to re-accelerate than if you had stopped completely. Turn your car off: Anytime you have to idle the engine for more than 30-60 seconds, you will save money by turning off the ignition. If you are chatting with a neighbor, sitting in a drive-thru waiting for coffee, food, or bank statements, you might consider shutting off the engine. The gas required to restart the engine will be less than the gas required to idle for several minutes. Nobody that owns a car likes to see gas prices rise so rapidly, but applying these tips will save you money and buy you a little peace of mind knowing that you’re getting the most MPGs possible from your vehicle. Plan your errands or walk to get them done. Less trips in the car = less gas! My favourite way to save gas and the way I have found most effective is to drive according to the tachometer as opposed to the speedometer. You kind of touched on it by saying to avoid accelerating wildly. If there is no traffic I just keep my car around 1500 RPM regardless of the speed I am going. I slow down a lot going up hills and make sure to build up some speed going down, and on a straight away it is a constant cruising speed. If there are cars behind me I can’t because it really affects the flow of traffic but I do it whenever I can. You could add to the above gas saving ideas that simply driving with you mpg function always turned on to grade your self on the mpg computer reading of you car when you could be coasting instead keeping your foot on the accelorator. Of course not all cars have the mpg function avaiable to the operator but for those do, I calculate that it helps me raise the average mpg over a tank of gas by approximately upward of 5% on in town driving. This ideas does not apply to highway since driving with the cruise control does similar functions for you. It is a good teaching tool and a constant challenger to your conservation objectives. I bought a used Segway and moved to a nice apt close to where I work. I leave my car parked and ride the Segway to work. My last tank of gas for my car lasted 5 weeks! !